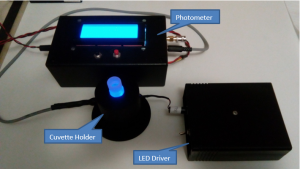 The absorption photometer is based on the photodiode photometer already described in the post: PSoC based Photometer. To use the photometer in absorption measurements we have prepared a cell-holder cell with two side openings. In an opening the photodiode is inserted, connected to the photometer, in the other opening the illumination LED is inserted, driven at constant current at 20mA with the CL520 regulator. 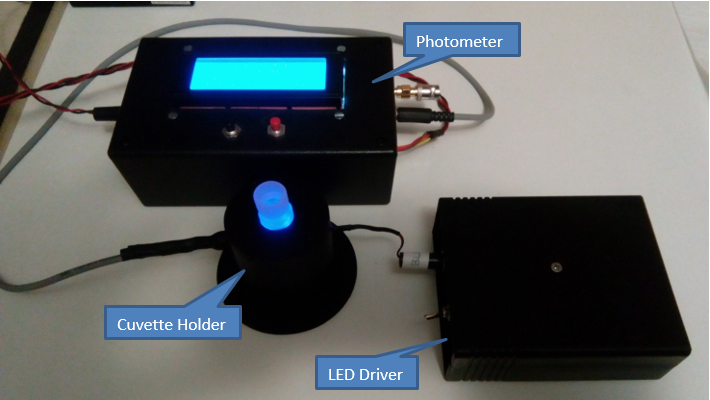 The image below shows the cell, the LED driver and the photometer. In order to be able to modify the band of use of the photometer we have prepared LEDs of different colors : blue, green, red, yellow, infrared. In this way we have the possibility to easily take measurements over the entire visible range without using filters or spectrometers. In Optics the Lambert-Beer law is an empirical relation that correlates the quantity of light absorbed by a medium, to the chemical nature, to the concentration and to the thickness of the medium crossed. 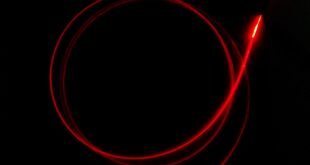 When a light beam (monochromatic) of intensity I0 crosses a layer of thickness l of a medium, a part of it is absorbed by the medium itself and a part is transmitted with residual intensity I. Transmittance (T) is defined as the I/I0 ratio while the absorbance (A) as the opposite of the logarithm of the transmittance A = log (1/T). where ελ is called the molar absorption coefficient, M is the molarity of the solution and l is the geometric path. The value of ελ is considered constant for a given substance at a given wavelength, although it may undergo slight variations with temperature. Moreover, its constancy is guaranteed only within a given concentration range, above which the linearity between absorbance and concentration can be affected by chemical-physical phenomena (for example the precipitation of the colored chemical species). The measurement of the absorbance of chemical solutions at typical wavelengths is the principle on which spectrophotometric analysis is based. With our absorption photometer we verified the Lambert-Beer law using dilute solutions of potassium permanganate. As known, this salt gives rise to solutions in water of a characteristic color which, depending on the concentration, ranges from pink to dark purple. 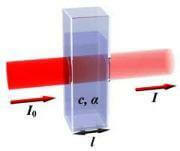 For these tests we used a red LED, as seen in the image below. 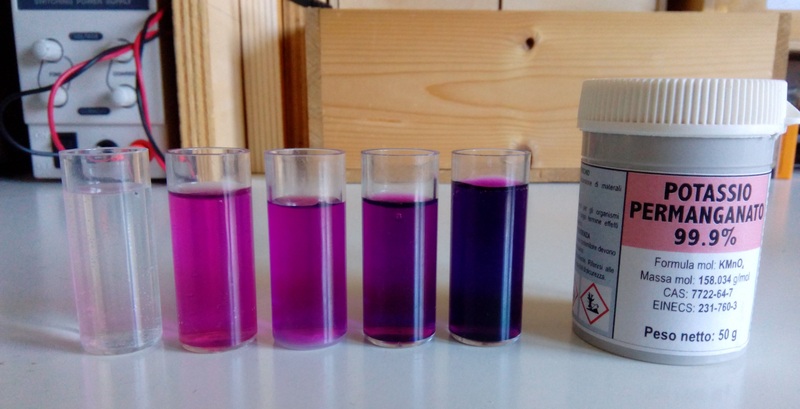 We prepared four aqueous solutions of potassium permanganate, dissolving 0.1g of substance in 100ml of water (corresponding to a concentration of 0.0063M) and subsequently diluting so as to obtain halved concentrations at each subsequent dilution. 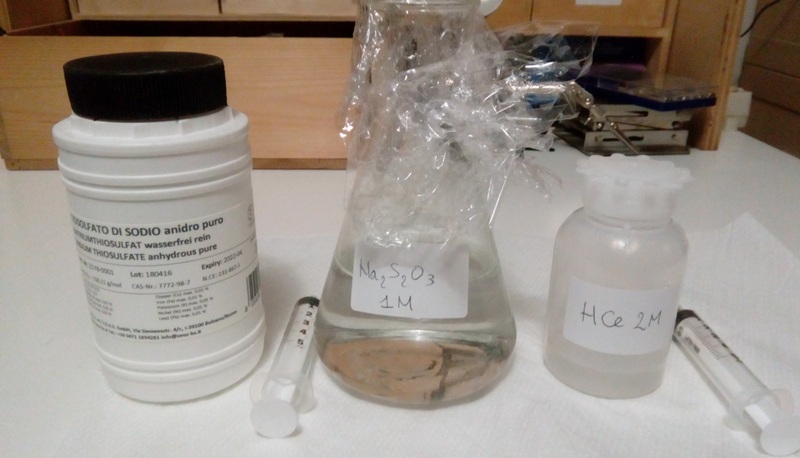 The image below shows the test tubes with the four solutions: the most concentrated on the right, the least concentrated on the left, the last tube on the left contains pure water. With the data of the five measurements (four solutions plus the test tube with pure water) we calculated the absorbance for each of the solutions and we have drawn the graph below which relates the absorbance to the concentration. We see how the points show a linear relationship and identify with a good approximation a regression line whose slope allows to determine the absorption coefficient of potassium permanganate. The photometer also helps us in the study of the kinetics of chemical reactions. Chemical kinetics is a vast and interesting field of study and research. Thanks to the study of the kinetics of the reactions it is possible to obtain a lot of information on the physical interactions that occurs between the molecules of the reagents. This reaction generates different products : sulfur dioxide, sodium chloride, water, but above all colloidal sulfur. The latter will be the key to the experience as making the solution cloudy will act as an indicator of the reaction. The image below shows the reagents used. 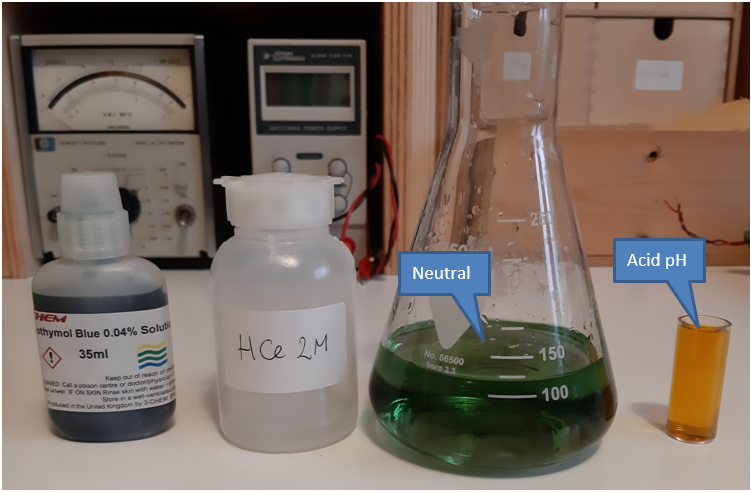 A solution of sodium thiosulphate of concentration 1M was prepared and reacted with a 2M concentration solution of hydrochloric acid. 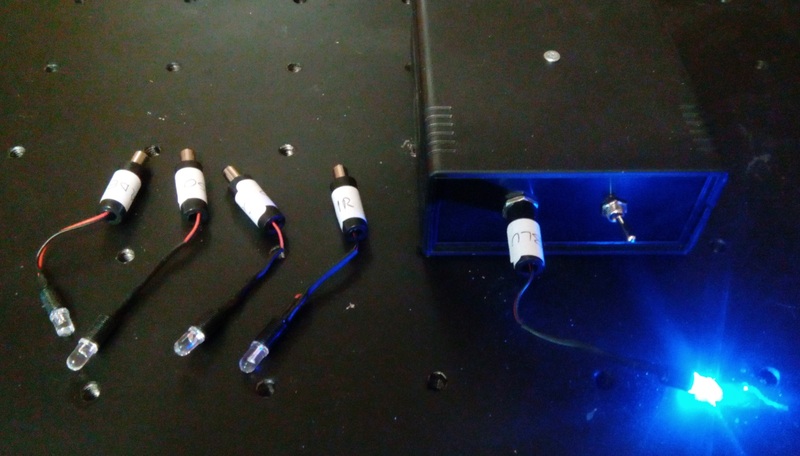 The test tube is placed in the photometer and illuminated with blue light LED. The measurement results are sent via serial interface to a Raspberry PI and recorded on file. The data is recorded with a frequency of 100Hz. The graphs below show the trend of light intensity measured by the sensor and the trend of absorbance. In the first part there is a certain variability of the signal, which corresponds to the phase of mixing the reactants, immediately afterwards, the transmittance starts to fall, to approach zero within about 2 seconds. The trend of the absorbance is similar but inverted, at the beginning it is zero, to then increase following a linear trend in the central part of the reaction. In the final part of the reaction the trend stabilizes because the mixture has become almost opaque. The initial moments of the reaction are affected by the mixing phase of the reactants, while in the final part we exit the linearity zone. In the central part of the reaction, the Lambert-Beer law applies, whereby the absorbance is proportional to the concentration of the reaction product : colloidal sulfur : by evaluating the trend of the absorbance we can therefore have direct information on the sulfur concentration and therefore on the reaction itself. The same measurement was made for sodium thiosulphate concentration of 0.5M and 0.25M. The graphs below show the trend of absorbance over time for the three different concentrations. In the second graph, only the linear parts of the curves are compared, together with their respective linear regression lines. Bromothymol blue is an organic compound used as a pH indicator. It is presented in concentrated ethanol solution as a green-blue colored liquid. In its normal form (acid) it is yellow, while its conjugate base is blue; due to this color difference between the two forms, bromothymol blue is used as a pH indicator. It has a color change range between pH 6.0 and pH 7.6. The protonated form, ie with acid pH, of bromothymol blue has the absorption peak at 427 nm, therefore transmits yellow light in acid solutions and the deprotonated form, ie with basic pH, has the absorption peak at 602 nm, thus transmitting blue light in more basic solutions. To study the color change that occurs when the pH changes we can use our photometer, equipped with the yellow LED. Let’s start with a neutral solution, so bluish, and add hydrochloric acid so as to lower the pH, the color changes from blue to yellow and consequently increases the transmittance of the solution to the wavelengths of yellow light. 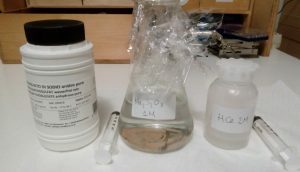 The image below shows the reagents used. In the following graph we show the trend of the luminous intensity (transmittance) measured by the sensor during the reaction that leads to the color change. 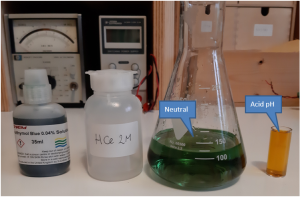 The measurement with the photometer shows a fast (of the order of 0.1 s) change in the transmittance that settles on values ​​corresponding to the final pH of the solution. The calibration of the instrument would allow an accurate measurement of the pH of the solution.